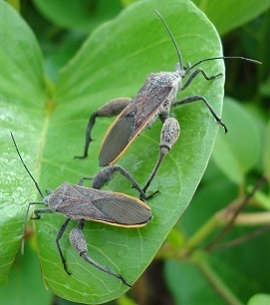 I started this article on leaf-footed bugs. 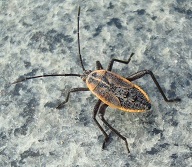 Later, I realized that they could be called by some other names such as squash bugs. With more pictures of different type of bugs collected, I decided to keep this corner to true bugs and their host plants. Finding the host plant of a bug was actually quite interesting. 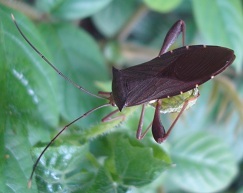 A single bug on a plant might not tell you much about the host plant. The bug might just happen to come by and decided to take a rest there. But, mating bugs with their nymphs gathering on a plant was a different matter altogether. They were there for a good reason. 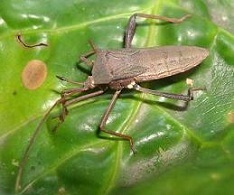 The distinctive feature of a leaf-footed bug is the swollen femur of the hind legs. 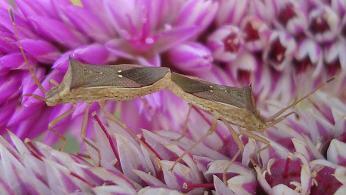 Like most true bugs, they feed on plant sap and logically, they should usually be found on their host plants. They may gather in large numbers during mating period. This was exactly what I saw on the Ipomoea pes-caprae (beach morning glory) in May 2009. Beside the swollen femur, the edge of the back of the body had an orange rim. Furthermore, the lower part of the hind leg had a hook-like structure. 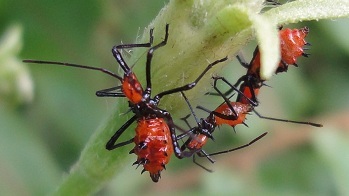 These should be sweet potato bugs (Physomerus grossipes). Did someone mixed up a sweet potato creeper (Ipomoea batatas) and a beach morning glory creeper though they do belong to the same family (Convolvulaceae) or the bug really is affiliated with sweet potato? 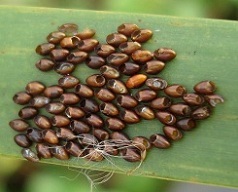 Their eggs were laid on the long and slender leaves of Typha angustifolia (cat's-tail) and Megathyrsus maximus (buffalo grass), found at a nearby pond. Some of the eggs were hatched, leaving behind the empty shells. A swam of newly hatched nymphs was seen on top of their egg shells. 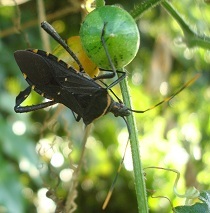 This is one of the rare examples in the squash bug family (Coreidae) that exhibit maternal care behaviour by guarding the eggs as well as the nymphs. 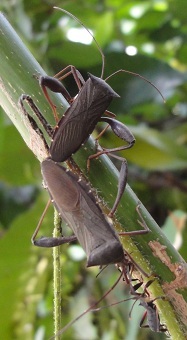 The young bugs looked quite different in appearance as compared to the adult bugs. The distinctive orange rim on its upper abdomen gave away its relationship with its parents. Most of them had taken shelter around the stems of the beach morning glory, well shield by the leaves on top. The plant probably also serve as a food source (plant juice) for the nymphs. A lone nymph was wandering alone on the concrete path, unaware of the risk of being flatten by "giant" human beings or becoming the food of others. 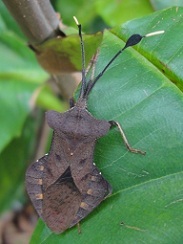 The next bug (Mictis longicornis) or rose coreid was first found on a lone Polyscias scutellaria (Shield Aralia) shrub in a park in July 2008. This plant had to be one of its host plants since quite several adult bugs and their nymphs in various stages were always seen on the shrub. 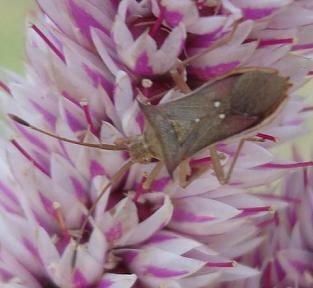 Later, I started seeing this bug on the Mikania micrantha (Mile-a-minute Weed) and Gymnanthemum amygdalinum (Bitter Leaf). This bug did not seem to have a specific host plant but a variety of them. 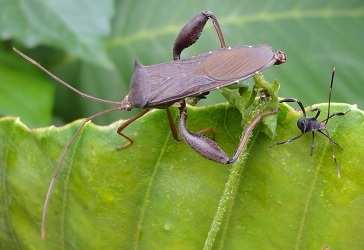 Viewing from the top, the adult bug has a red abdomen with 4 tiny lines going across. Some development stages of the bugs were shown in the pictures below. 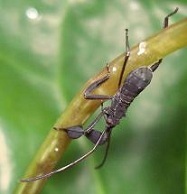 It starts with a nymph which is black in colour with flap on its lower part of the front legs. 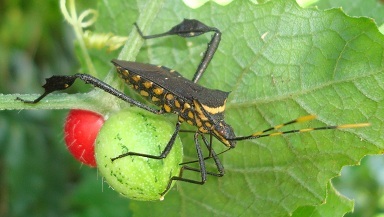 As the nymph grows, the flap disappears and the upper part of the hind legs started to swell. The far right picture showed an army of Yellow Crazy Ant (Anoplolepis gracilipes) feasting on a dead adult bug. Below is the picture showing the relative size of a new born bug to an adult. 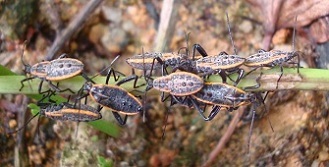 In November 2010, I spotted a group of spiky orange insect on another creeper, Gymnopetalum scabrum. 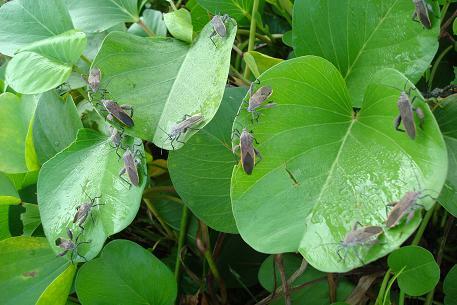 They should be the nymphs of this particular leaf-footer bug. 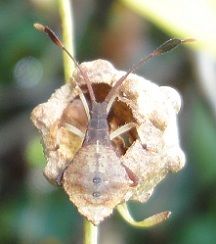 The next bug has a pair of spiky structure on its head with a white abdomen. 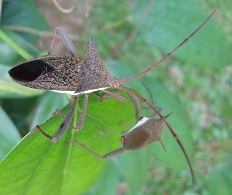 A family of four consisting of 2 adults and 2 nymphs were found on the climber Akar Kuning (Fibraurea tinctoria) in May 2011. Its name should be Aspilosterna albovittata. 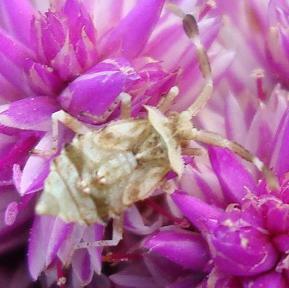 This bug found on the flowers of Celosia argentea (Cockscomb) should be Cletus trigonus although another possibility is Cletus punctiger. It has 3 small white spots located on its back. It was not easy to spot the nymph (last photo) due to its small size and the colour shade of its body that blend rather well with the colour of the flowers. The first time that I came across this bug (Dalader sp.) was in December 2010 at a park. 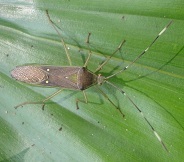 The lone bug was on a leaf of the Dillenia suffruticosa (Simpoh Air) shrub. 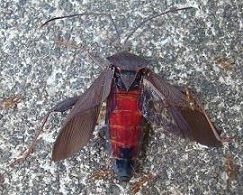 The next occasion that I saw the same bug was 8 months later in August 2011 at another park. This time round, there were several of them on the stem of a young Macaranga bancana (Mahang) and a Dioscorea bulbifera (Air Potato) vine was twining around the stem of the Mahang plant. I thought the Mahang was hosting the bugs. This was proven incorrect a few months later. 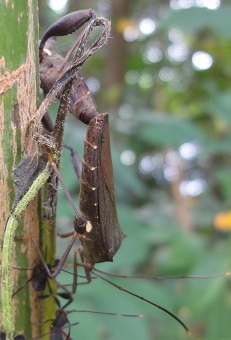 In December 2011, I finally saw the nymphs of the bug together with the adult bugs. This was the time that I was actively searching for a red beetle (Lilioceris cheni) that feed on the Air Potato vine. While searching through the vine for the beetle, I saw this colony of adult and young bugs gathering on the vine. I can now safely conclude that the Air Potato is indeed its host plant. This conclusion did not come to me a few months back when I saw the adult colony. If not for the beetle, I probably would not have spotted the bug. Their dark-brown body colour merges rather well with the stem of the plant where the vine was hanging on. 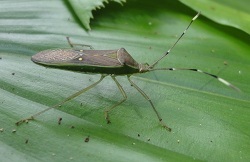 This bug flew across my path, while I was walking along a track in December 2011, and landed on the leaf of a Caryota mitis (Fishtail Palm). It has 3 tiny white patches on its back and white segments on its antennae. This was the first time that I had seen this bug and it was all alone. There was thick vegetation at the side of the track and I was not able to figure out where it came from. 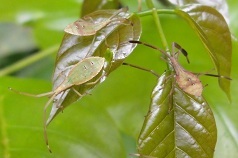 A month later in January 2012, at around the same place, I spotted a mating pair on a leaf of the Millettia pinnata (Pongam Tree). I started looking around the branches of the tree that was at my eye level. Sure enough, I saw 5 nymphs gathering around some young leaves. Another bug successfully matched to its host plant that signalled a good start for the New Year although the identity of this bug is still unknown.